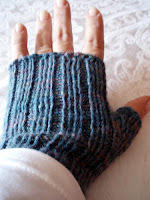 I don't think I'm alone when I say that with the advent of Ravelry, I'm finding that I'm ignoring my blog. It's not that Ravelry and Knotasissy are so similar. T'hey both chronicle my knitting, but Knotasissy is much more personal and Ravelry takes less emotional energy when I'm feeling like shutting the world away. I have to be careful to resist my temptation to hibernate completely at this time of year. To that end, I'm going to bore all who stumbles in here. First and most exciting is the news from my sister and my youngest daughter that they will be participating in Ride for World Health . My Sis will be riding the entire cross country route. My daughter will ride the final leg from Ohio to Washington, DC. I'm so proud of them both, I could pop. This year's ride will benefit Medecins Sans Frontieres Imagine that! As we know this is a charity near and dear to the hearts of many knitters. Quel Coincidence! By the way my sister is on the far left in the bottom row of cyclists. This is a gift she's giving herself for a very big birthday. She is one of the most focused and determined people I know. She is my baby sister and I am constantly in awe of her achievements and contributions to the greater good. This is a woman who, while working as an RN on weekends, raising 3 children, caring for a home and husband, commuted 200 mile each way to midwifery school during the week. She is now a practicing midwife with a very successful practice. But hey, she's conquered that and her two sons have graduated university and are on their own. Her daughter is about to graduate High School and her life just needed a new challange. So while she is still a midwife and a community activist, social change is slow and she needed something else. Hmmmmm, how about riding a bicycle cross country for world hunger? See what I mean? I'm tired just writing about her. I'm sure I've forgotten something, but I wouldn't want anyone to think she was toooooo good. Ok, from the sublime to the "ordinaire". What do I do when I hibernate? Knit, of course! I also remove layers of accumulated "stuff". In this big old rambling house, I had yet to find a spot for myself. I finally carved out a corner, and I do mean a corner, of our bedroom in front of the fireplace. I would say it's about 3x3 with a small cabinet and end table with a chair wedged in between. I have an ott floor lamp behind me. I haven't taken a picture yet because I must find a different chair as the one I'm using is literally falling to kindling. The result of this little change is that my knitting productivity has risen considerably. In the last two months, I've started and finished most of what is on this page.